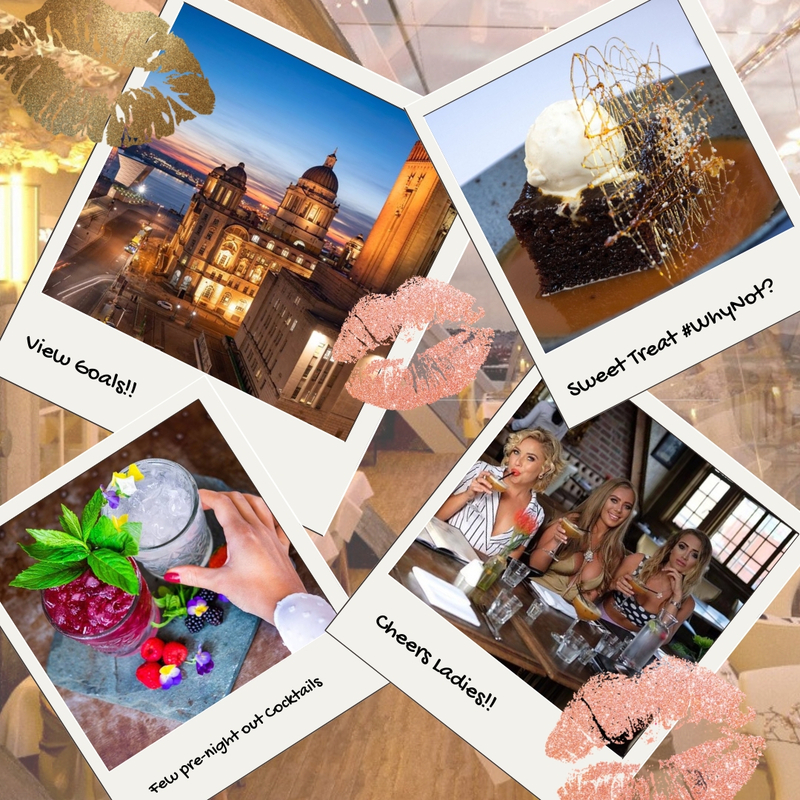 When the girls get together there’s nothing they can’t handle, so when it comes to planning a girl’s night out in Liverpool, go all out and celebrate your besties by booking the best nightlife, food and accommodation in the city. Here’s how to throw an epic girl’s night out in Liverpool, Signature Living style. There’s nothing quite like a girl’s night out in Liverpool and the best ones start when you’ve booked the most picture-perfect party accommodation at Signature Living. 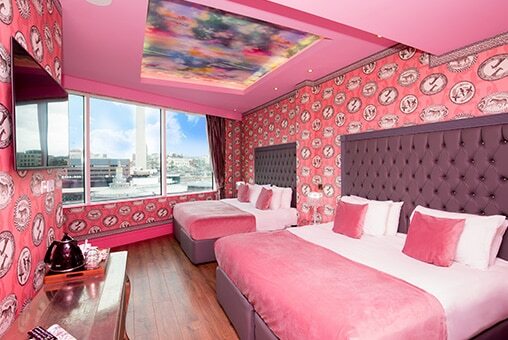 Check out our stunning hotel rooms that make the perfect backdrop for all those pre-night out selfies. 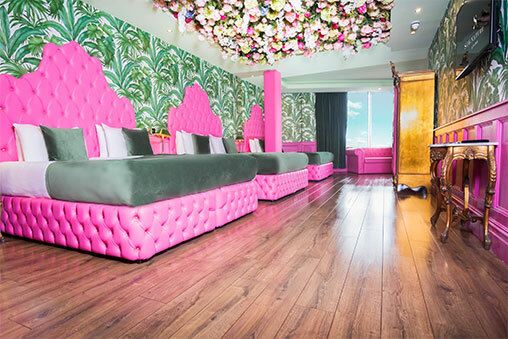 Every Signature Living hotel room, from the botanical beauty of Garden of Eden to the outrageous OMG Suites have glamourous ensuite bathrooms, huge double beds and quirky one of a kind décor. 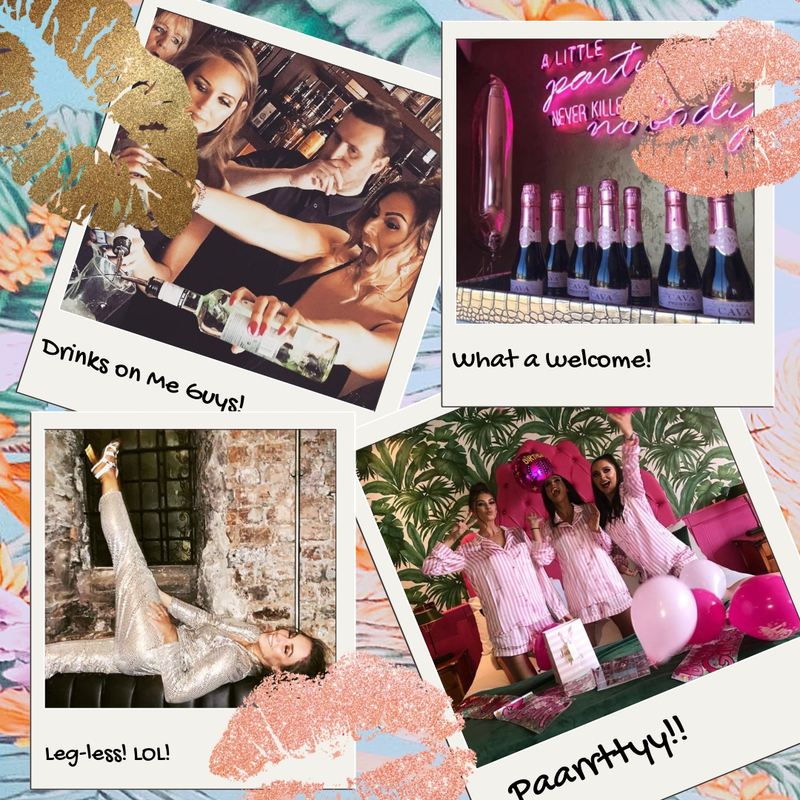 Get ready to update your social profile and break the internet with some seriously funky Insta-stories and make plenty of picture-perfect memories from your girl’s night out in Liverpool. When it’s time to get ready, Signature Living’s luxurious party hotel rooms will give you all the tools you need, including pre-night out drinks, your own glam squad and more reflective surfaces than a funfair’s house of mirrors. Our High Heels and Hairspray offer includes a visit from our very own glam squad at The Salon. They’ll descend on your party like Glam-fairy godmothers, ready to bring out the very best in you with their makeover magic. Then its up to you to pull out your best out-out outfit from that suitcase, and wow the entire city with your fabulosity. We know you’ve got it in you girls! Every girl’s night out in Liverpool should begin with a tasty group meal and a few cocktails and there’s nowhere better to enjoy glam, gastronomic delights than our very own Signature Living restaurants. Check out the dizzying heights and first-class service in Carpathia Champagne Bar and Restaurant or go hotter than hot at Alma de Cuba for classy Cuban dining. Both locations deliver a special kind of dining experience that can’t be beaten anywhere else in the city. In Carpathia, the high-quality fine dining menu is further complemented by striking views of Liverpool’s iconic waterfront. At Alma de Cuba guests can enjoy delicious Cuban inspired dining and an endless list of cleverly creative cocktails, all served at the heart of Liverpool’s busiest nightlife district. No matter which you choose, you and your ladies are guaranteed a marvellous meal to kick off an unforgettable girl’s night out in Liverpool. There’s no doubt Liverpool has some of the best nightlife in the UK and the city is often noted as the top destination for guaranteed good times. And no girl’s night out in Liverpool would be complete without a good boogie. There are tons of places that we’d recommend for a great night out in Liverpool all over the city, but none compare to Alma de Cuba. 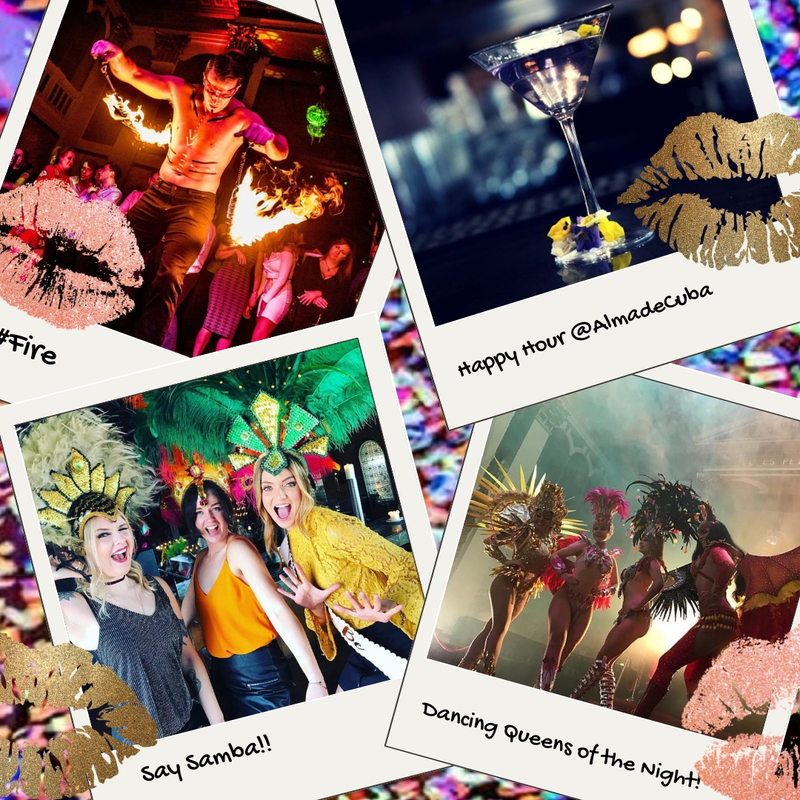 Everything from the unrivalled carnival atmosphere, to the exciting live entertainment, and nonstop live DJs make Alma de Cuba the number one choice for a girl’s night out in Liverpool. Book a private booth to enjoy personalised table service all night long, dancing with our sassy samba dancers and the best views of all the exciting nightlife action. At 11 pm sharp the heavens will open as the famous petal drop begins, followed closely by the hypnotic live floor show Voodoo at midnight. From here on in, the party doesn’t stop until the last person leaves. There ain’t no party like an Alma de Cuba party, the perfect place for an unforgettable girl’s night out in Liverpool. You and the girls can enjoy all the best bits of Liverpool from the heart of the city, using any of our amazing accommodation offers and packages. Enjoy a huge selection of party and accommodation offers for weekends away with the girls, including the Ultimate Girls Weekend and our Here Come the Girls deals. Or why not see what Liverpool has to offer in mid-week by checking out our amazing weekday stay deals, including our All the Single Ladies offer which is available Sunday – Thursday and includes pamper hampers and welcome Prosecco. The ultimate girl’s night out in Liverpool starts and ends with Signature Living, it’s up to you what you do in between. Call 0151 236 0166 or email info@signatureliving.co.uk and start planning the ultimate girl’s night out in Liverpool today.